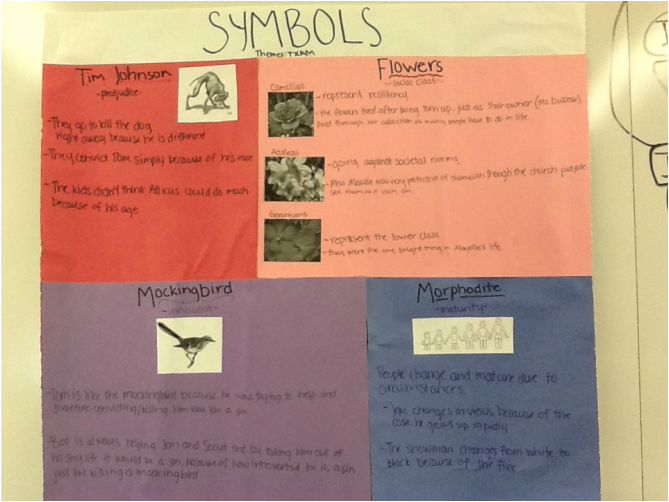 In the book, To Kill a Mockingbird, symbols helped create different motifs. The purpose of the project was to help us realize the different symbols, themes and motifs in the story. Having us participate and think outside the box in this activity assisted us in making different connections to multiple symbols which made us think about the motifs and themes connected to the symbol. Making these different connections helped with realizing motifs of the story. A motif is a idea, picture, symbol song or action that repeats its self and contributes to the major theme of the story. Tim Johnson is one of the symbols that creates a motif. Tim creates a motif of bias in the society of Maycomb. He was a mad dog that Atticus shot one day. He was shot because he was different from the other dogs. Nobody gave him a chance because he was different which was similar to Tom Robinson. Tim and Tom Robinson's situations were very similar. They both got convicted of something because they were different and didn't fit in with the society. Tom was accused of being guilty because mostly of his race. Both of these events are examples of Maycomb being prejudice. Morphodite is a symbol that creates a maturity motif. Jem changes his views because of the Tom Robinson case. He starts to mature really rapidly when he learns more about the case. Another example of the motif is the snowman. It changes quickly from white to black because of the fire that burnt down Miss Maudie's house. Morphodite in To Kill a Mocking Bird has a motif of change and maturity. The mockingbird in the book creates a motif of innocence. Tom Robinson being innocent but being accused of doing the crime against the Ewells' was a sin. He got in trouble for trying to help a young lady but he never did any harm. Throughout the story Boo was trying to help Jem and Scout from sending them different things in the tree to saving their lives. If the public found out that Boo killed Bob Ewell it would have changed Boo's life. He would then have to come out of his house and socialize more which was something he was not use to doing and didn't like to do. Having him come out of his house and socialize with people would have been a sin since he did not want to do it and he was causing no harm in his house. Both of these two situations are motifs to the symbol of a mockingbird. It was a sin to kill a mocking bird because it did no harm, it only brought joy to people. The different flowers symbolize the different social classes in the people of Maycomb. The geraniums come from Mayellas and symbolize the lower class. These flowers grow everywhere like weeds. The Ewells' are known as "weeds" of Maycomb. The azaleas represent the people who go against the normal class. People in Maycomb thinks of their church as their community. Ms. Maudie goes against the people at her church that say her flowers are sinful, she is very grateful for her flowers and cares for them. The last flowers are the camellias and they represented the people who had a drug addiction. Mrs. Dubose owned some very beautiful camellias. She was addicted to morphine but when she died their was not a drop of morphine in her system. She overcame the drugs just like her flowers overcame being destroyed by Jem. The flowers symbolized a great deal of class in Maycomb. Knowing what motifs are and how they worked helped understand more parts in the story. Having them be repeated throughout the story made people think that their was something important with the symbol. These symbols could mean different things depending upon how you look at it. The author did an amazing job of creating these symbols which have a great meaning to them. Motifs help you realize the important symbols in which the author writes about. In my TKAM Literary Analysis I wrote about several different ideas. I talked about irony and how irony creates peaks and falls within the novel. When talking about irony I exspressed in detail how situational, dramtic and verbal irony contributes to the novel. I summarized how literary devices added to the novel. Writing this analysis, I learned more about how much literary devices connect to the novel and to the reader. When writing and reading To Kill a Mockingbird I experenced the diffrent ways the author keeps the reader involved within the novel. Through this involvement I learned what methods were used and exspecially learned how irony was used throughout the story. Harper Lee created great irony to keep the reader connect to the novel.